I had just completed my newest essay about living on a sailboat. After sitting in front of a computer for the last five hours, I needed a break, not to mention a good dinner. My consort suggested we try Grassroots, a newer restaurant in the Town & Country shopping center. I knew little about this restaurant except that the owner, Christopher Collins’ father (Wally Collins) owns Wally’s American Pub ‘n Grille. The restaurant’s interior felt cold and monotone. It’s a typical sports bar with large flat screen TVs dominating the captive drinking audience. A few couples sat at large, comfortable booths and high-tops for four or more. Lots of singles ordering appetizers and drinks—a good place to forget your troubles after a long day at the office. If you’re drunk enough, you may not notice the quality of food or service. Unfortunately, we were sober. She told me the owner wasn’t there, so I gave her my business card and informed her that I was about to review the restaurant. We ordered an appetizer called DAD’S GROCERY BAG, a loaf of French bread, three cheeses, three cured meats, olives, nuts, and local honey. Let’s start with the positive. The cheeses, Port Salut, Brie, and chèvre, were tasty. 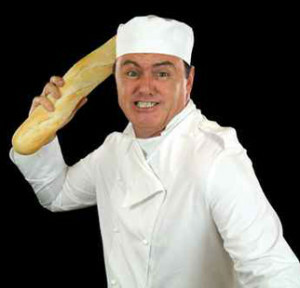 The French loaf turned out to be white bread, not French, which the waitress wasn’t aware of and claimed not to know the difference. The meats, a bland prosciutto, sopressata, and a mystery meat took up their share of space on the cheese board. I have to say the brined olives tasted good, just like the ones we buy a few doors down at Whole Foods. I should have known that is considered ‘local.’ I almost forgot to mention the Crockett honey bear served with the dish. Not too classy. We were hoping to find good BBQ in the neighborhood when we ordered the ROOT’S BBQ BRISKET, served with cheesy grits, pickles, and BBQ beans. The meat presentation looked odd from the start—a rectangular log with a quarter-inch fat cap. 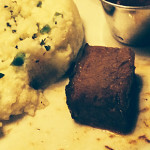 To make the trendy boxed cut, they must have wasted the best part of the brisket. The texture of the meat was gummy, dry, and tough lacking the rich, slow-cooked meaty flavor. It didn’t fall apart or melt in your mouth like Mom’s brisket. In the words of Christopher Collins, “We’re American with Southern influence.” I’m not sure what recipe the chef uses, but it’s not the best of American or the best of Southern. It seems to be an enigma unto itself and a tasteless one at that. 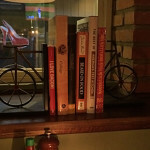 There were six cookbooks sitting on a shelf behind our booth. 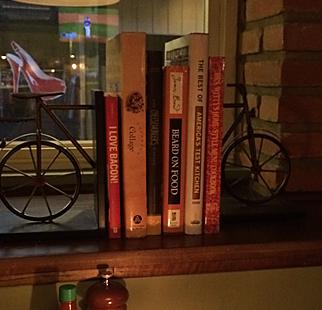 Perhaps the chef should study up during a slow night. The waitress came over when we finished and asked how we liked the brisket. I gave her my critique and she said, “I’m sorry you didn’t like it.” I even went so far as to tell her I couldn’t eat more than two bites; one to find out how it tasted and the second because I couldn’t believe this entrée was trying to pass as brisket. Within minutes of clearing our dinner plate, a short blond man in a white chef’s jacket came to our table with a scowl on his face (we now know that he is Robbie M., a manager wearing chef’s garb). He was arrogant beyond his experience. “I heard you didn’t like the brisket,” he said without salutation. We explained to him what we expected from the entrée and he commented, “That’s the way I make it and it isn’t going to be changed.” Then he left in a huff. The waitress came by and said, “Sorry again. Would you like something else?” We ordered the Key Lime pie with whipped cream, only to be polite and fair since our dinner was such a disappointment. She sounded as if it would be comped, which would have been expected. The pie tasted like it had been in the cooler for a few days, a bit heavy and too sweet. By this time, our expectations had diminished and our taste buds had suffered cruel and unusual punishment. When the waitress presented us with a check for $50.00 (including the cost of the Key Lime pie), she asked if we talked with the “chef.” We told her “Yes, but he was arrogant and acting stupid (referring to his attitude and cooking knowledge). We’re of the opinion that people in the service industry should smile and remember, ‘the customer is always right.’ In this case we were. On our way out, we asked the hostess for a paper menu and the owner’s business card when we were accosted by the angry chef-manager, acting as ‘bouncer’ (we’re not sure what role he plays in the restaurant). We were glad to see he wasn’t wielding a meat cleaver. He told us in a loud unfriendly tone, “Your waitress said you called me stupid. Get out and never come back.” I think by then he knew we had no intentions of returning or writing a positive review of his cooking or antics. Suggestion for Grassroots owner: Anger management and service professional classes are in order for this employee. So he bounced us and wouldn’t you know, we had forgotten about our recent Judo lesson. We should have assumed a defensive position and said, “Back off.” Who knew this could occur at Grassroots restaurant, or any establishment. I want to think this type of behavior would not be tolerated if an acting manager or owner had been present. I later learned the owner was on vacation and the general manager wasn’t present.